1. Whether it is a scientist or a Buddha, each is “discovering” the way the nature works, i.e., reveal to the world what the fundamental laws of nature are. To appreciate what a Buddha does in comparison to a scientist, contemplate on the following: The scientific knowledge we have today is the CUMULATIVE effort of thousands of scientists, each one taking the knowledge a little further. As Newton said, “I was fortunate to stand on the shoulders of giants to see further”. Not all scientists make similar contributions. Galileo, Newton, and Einstein made “giant leaps” in comparison to the smaller steps taken by other scientists. Now with cumulative effort over many hundreds of years, science has made significant advance concerning understanding the some of the fundamental laws relevant to INERT MATTER. On the other hand, there is virtually no progress in understanding how the mind works; see, “Cosciousness – A Dhamma Perspective“. 2. As I build up this site anyone will be able to see that Buddha Dhamma is the ultimate Grand Unified Theory. It explains everything not only the behavior of inert matter and living beings that we can see, but also the existence of infinite number of worlds with living beings in 29 other realms of existence (other than the human and animal realms) that we cannot see; see, “The Grand Unified Theory of Dhamma“. Buddha Dhamma is not a religion in the sense of providing salvation. The Buddha was not a God, a prophet or a messenger. He was a human being who purified his mind to perfection so that he could see the whole of existence. The Buddha was the greatest scientist, who investigated the problem of existence and found the complete solution. We all need to find our salvation by following the Path that he prescribed to purify our minds. 3. Newton could not have discovered the laws of gravity if it were not for the efforts of scientists like Brahe and Copernicus. Similarly, Einstein could not have discovered relativity without the knowledge passed down by other scientists. Quantum mechanics would not have been possible without the efforts of multiple scientists who moved forward with the evidence gathered by hundreds of other scientists. The Buddha in comparison, discovered the complete set of laws about the WHOLE EXISTENCE by his own efforts. This includes not only the way inert matter behave on this Earth, but all of existence in the 31 realms that science is not even aware of; this includes the way inert matter behaves in all 31 realms AND the minds of beings in those 31 realms. I recently proposed an explanation for the existing controversy over the “non locality” issue in quantum mechanics and it is based on the premise that everything in this universe is connected at the deep level; “Quantum Mechanics and Dhamma“. 4. We could say that minds of the caliber of Newton and Einstein appear roughly every 100 years. Mind of a Buddha is infinitely more advanced and appears once in many billions of years if beings are lucky. There have been four Buddhas in this Mahā kappa (basically the lifetime of the Solar system that we live in, roughly about 10 billion years), but the last Buddha before them was born 30 Mahā kappas ago, i.e., there was a gap of 30 Mahā kappas (roughly a trillion years) without a Buddha appearing in this world. The Buddhas use a method that is totally different from the “scientific method” used by the scientists. Instead of conducting experiments on inert matter, they conduct mind experiments. Answers to ultimate questions on the existence of living beings who have complex minds can be found only by PURIFYING a human mind to the ultimate level; that is what a Buddha does. 5. I will try to provide at least some details of the complex world view that was provided by the Buddha, which has been been muddled and distorted within the past 2500 years. Now let us examine one case where it took 2500 years for science to come to be consistent with one part of Buddha Dhamma’s world view. 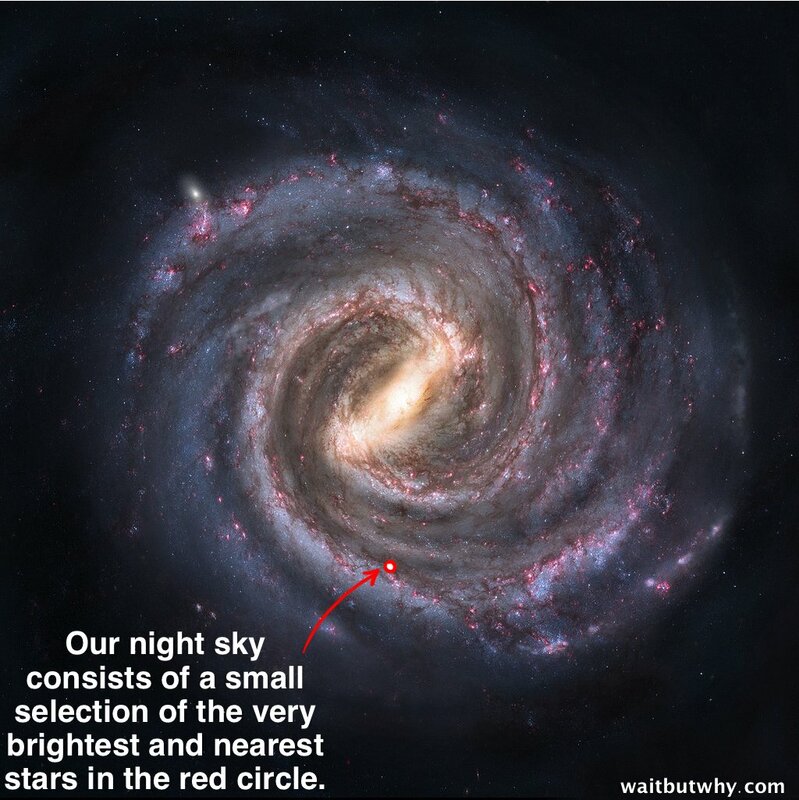 Here is a picture of our Milky Way galaxy. We can see only a couple of thousand stars, but there are hundreds of BILLIONS of stars in our galaxy, and there are about an equal number of GALAXIES in our universe. Thus for each star in our galaxy, there is a whole galaxy out there. It is truly mind boggling. Therefore, Buddha’s view of the universe as consisting of innumerable “world systems” was not looked at favorably even a few hundred years ago. Of course that has changed now. His statement that “there is no discernible beginning to life” is also becoming vindicated with each new scientific discovery. With any of the scientific theories that are being evaluated now, the only difficulty lies in trying to comprehend how any Creator can keep up with the cosmic activity that is truly beyond comprehension. 2. In Buddha Dhamma, there is no First Cause (no Creator): Life always existed, and it will always exist. Each living being has gone through innumerable birth-rebirth processes without a conceivable beginning. However, everything in the “world around us” is impermanent, including our own universe (a “major world system” in Buddha Dhamma). Everything is born, has a transient existence, and finally decays. And this includes our universe as well; universes, like everything else, are born and eventually fade away. 3. if there is no beginning to life, then where did life exist before the “big bang”, i.e., before our universe came into existence? (actually, life is believed to have evolved on Earth very much later). People who lived even a hundred years ago had to take Buddha’s words on this point solely on faith (or based on the overall picture – as described by the Four Noble Truths and the Noble Eightfold Path – one could believe that it must be true). But we are lucky to be assured by the fact that modern science to give us some rather persuasive reasons to believe that life existed forever. Let us look at the emerging evidence. 4. Even as recently as at beginning of the 1900’s, Lord Kelvin, one of the top scientists of the day, estimated that the age of the Sun was < 40 million years based on gravitational contraction (atomic structure was not known at that time), and our knowledge of the universe was pretty much limited to the Solar system. So, this meant the age of our “known universe” was very short and thus the Buddha’s teachings on a beginning-less samsāra (or sansāra) seemed like a myth. Vindication of the Buddha’s teachings started at the beginning of the 1900’s with the advent of quantum mechanics and relativity: Discovery of radioactivity in 1898 by Becquerel and Einstein’s explanation of the photoelectric effect in 1905 led to the quantum theory of atomic structure, which in turn led to the correct picture of atomic fusion as the source of solar energy. So, by 1956, the age of the solar system was known to be > 4 billion years, and the age of the universe was estimated to be around 14 billion years. Yet, even billions of years is hardly the same as “beginning-less time”! 5. By 1929, Edwin Hubble proved that the distant galaxies are moving away from each other and from our galaxy, and that our galaxy is but just one of many galaxies. This was a vast understatement since now we know that there are 400 billion galaxies in our observable universe! The currently accepted theory on the “big bang” is the inflationary theory of Alan Guth; see, “The Inflationary Universe” by Alan Guth, (1997). However, there are a minority of scientists who do not believe in the “Big Bang”. They have proposed alternate theories; see, “Endless Universe” by Paul J. Steinhardt and Neil Turok (2007). 6. Buddha’s world view does not have a “Big Bang” beginning either. Life always existed and it will always exist in the future. I will start discussing some aspects of “the origins” later, when I have enough background material at the web site. 7. By the way, there are several theories currently being explored in quantum mechanics that are related to cosmology. There is one theory that requires a universe being existing for each possible event! So, there may be infinite number of parallel universes. For example, see “The Beginning of Infinity” by David Deutsch (2011). In all these theories there are multiple universes that always exist. In any case, the Buddha of course did not say which of these theories is correct. He just said life always existed, and it always will. But he did say that “star systems” — like our Solar system — come into being, exist for long times, and are destroyed at the end. 8. January 24, 2019: Relevant post: “Buddhism and Evolution – Aggañña Sutta (DN 27)“.